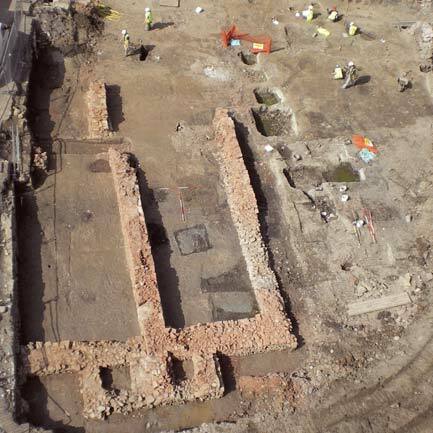 Amongst the many great sites Cotswold Archaeology has excavated, surely 1–2 Redcliff Street must be one of the best. 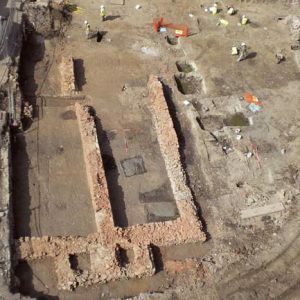 Situated in Redcliffe in the heart of Bristol, the excavation uncovered a large portion of at least six tenements, with well-preserved structural and industrial remains dating from the 12th century through to the later post-medieval period. 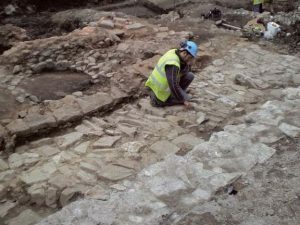 In addition to a complex sequence of building, which included both domestic and industrial features, the site produced a rich assemblage of pottery, bone and metalwork, telling us much about everyday lives of those who lived, ate and worked there. More unusually the assemblage also included clay mould fragments from copper casting, and the debris and products of a clay pipe kiln. 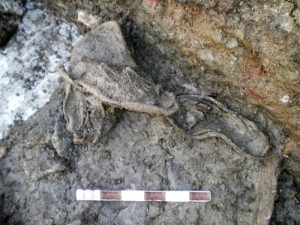 But what made the excavation one of the most exciting and informative that we have ever undertaken, was the wealth of organic material, including leather, wood, plant remains and insects preserved in the fills of pits and drains, thanks to the prevailing damp and anaeorobic soil conditions. The first buildings were constructed of timber; surviving posts in situ provided opportunities to date the structures by dendrochronology to a period shortly after the documented founding of the Redcliffe suburb in the early 12th century. To the rear of the plots were over 30 sub-rectangular pits associated with the production of dyes. Waterlogged plant remains suggest areas of the site specialised in specific colours. Cloth-dyeing was a widespread industry along the Redcliff and Temple waterfront, with supplies of raw materials and exports trafficked via the series of wharves along the river frontage. The waterlogged deposits also contained enough worn-out leather shoes and off-cuts to suggest a cobbler’s workshop (Fig. 1). Amongst the pottery assemblage, were the fragments of the ‘west country vessels’ with a distinctive inturned rim appeared in sufficient quantities to represent another craft activity in this period. The function of these vessels is still open to debate, and their presence here raises the possibility for their use in the dyeing industry. Stone buildings replaced the timber structures in the late 13th century, with circular stone dye hearths to the rear (Fig. 2), and a lane facilitating access to the rear of the properties (Fig. 3). The mid 14th century saw the development of a completely new industry represented by a large circular furnace and associated evidence in the form of mould fragments for the casting of lead-bronze cauldrons or posnets. 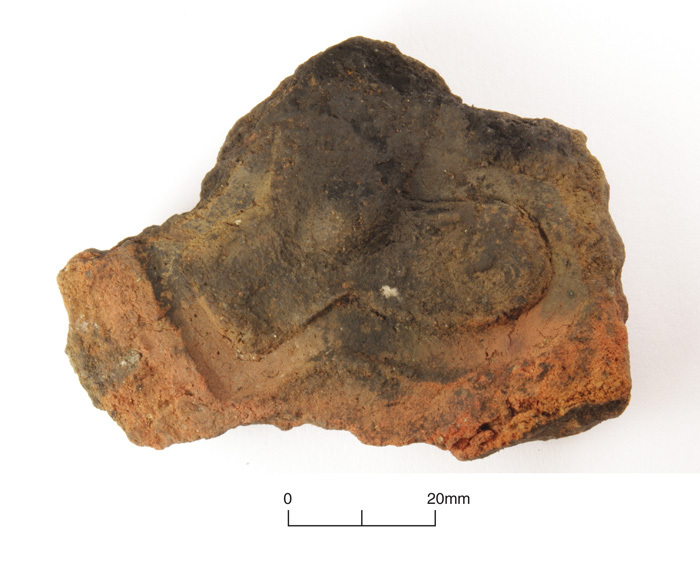 The mould fragment shown here is for a cauldron handle (Fig. 4). This enterprise was developed in the early 15th century, with the construction of one of the earliest examples of a reverberatory furnace found in Britain, and candle sticks and chafing dishes were added to the repertoire of products.